Journalist Marie Colvin, who died this February in a targeted attack in Syria on the day she was due to leave the country, was a longtime war zone reporter. She'd seen every kind of dangerous assignment, even losing an eye in the process. War correspondents don't often take time to give speeches, but Colvin did at this 2010 memorial service for fallen war zone journalists and their support teams, held at St. Bride's, a church in London's Fleet Street, the longtime home of the press corps. This speech and the service took place a little over a year before she died. Such a blast killed Colvin in February, and in her obituaries, the photos were primarily of her speaking at this event. What can you learn from this famous speech? Describe horror simply: Horrific circumstances don't need over-the-top adjectives to be powerful. Instead, stick to concrete nouns and verbs to convey what's happening. Let the horror stand on its own without too much embellishment. Know your history: In this speech, Colvin harkens back to the first British war correspondent and quickly sketches his circumstances, then describes those she faced in the modern day...but noting the long-standing similarities. The quick history lesson makes clear that the fallen journalists being honored are part of a long tradition. Explain what normal means: Describing a war zone is not unlike describing the surface of another planet--it's foreign to most of your listeners. Sharing simple, everyday descriptions will help your audience relate to and feel a connection with the strange landscape you're describing. 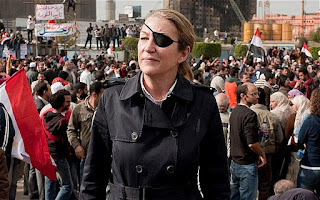 You can read the transcript of this speech, and in the video below, watch a tribute after her death by CNN's Christiane Amanpour, in which you can see and hear Colvin working and speaking. What do you think of this famous speech?